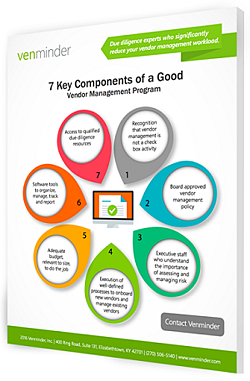 As you know, vendor management is not an optional activity, it's required by regulation. In 2017, your examiners will review your vendor management program and expect to see evidence of forward motion in the maturity of that program. To get you started, we suggest you review all the foundational elements of a good vendor management program and compare those against your own. To help, we've put together a free infographic to download on the 7 most critical components.